The MR361 series 4-Channel DIN rail-mount Fiber Optic Encoder Link System increases the reach of conventional electronics-based rotary and linear encoders up to 2000 meters via a fiber optic link. 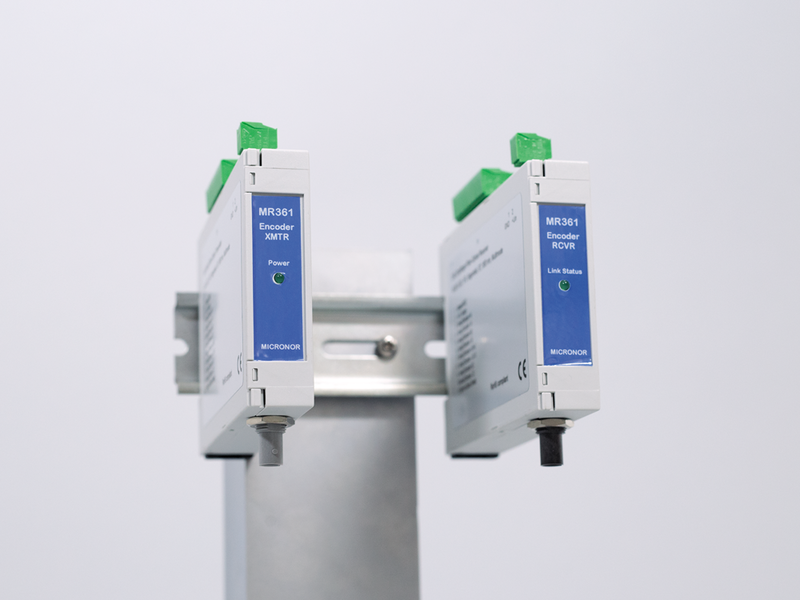 This product allows clean optical transmission of sensitive encoder signals over long distances, through noisy electrical areas or when routed in parallel with noisy VFD or High Voltage motor drive lines. The MR361 system works with both optical and magnetic encoders and operates with complete transparency to the motion control or motor drive system. The system consists of a fiber optic transmitter (XMTR) and fiber optic receiver (RCVR) module. The XMTR module multiplexes the encoder’s A/B quadrature and Index output signals into a light signal. A simplex 62.5/125 multimode fiber optic link transports the optical signal to the RCVR module which demultiplexzes the optical signal back into the individual signals. The modules can transmit up to 4 channels. Hence, the system may be used to transmit a single A/B/Index encoder or two encoders with A/B outputs only. An unused 3rd or 4th channel may also be used to transmit a control signal of the user’s choice.